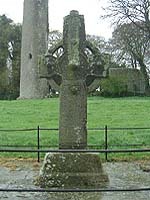 Kilree High Cross is believed to be of the 9th century. 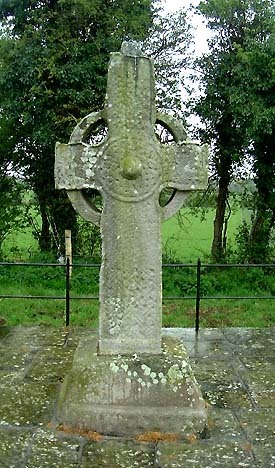 A badly weathered sandstone cross standing at 2.75 metres high, most of which is covered with bosses and geometrical motifs. The East face pictured right, bears a hunting scene on the arms. The ends of the South arm also has some figure sculpture but these are difficult to interpret. On the West face is probably an Adoration of the Magi and maybe Daniel in the Lions den. 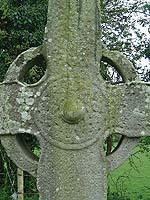 There is a tenon joint still visible so more than likely the cross was fitted with a capstone. The weather was not very kind to me on the day I took these pictures so I hope to visit again soon. This old monastic site is in the middle of a cow field with the cross standing at the far end of the Field. The most Dominant feature of this site is the round tower pictured below. 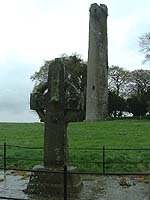 Situated: From Kilkenny take the N10 South to Stoneyford, here take right turn for Kells, at Kells keep left, after two kilometres you should see the round tower in a field to your right, the cross stands 150 metres behind the Tower. Discovery OS. Map: 67 S 497 409.